Blue Coat Advanced Web & Cloud Security will protect you against web and network-based threats, enable cloud data protection, and give you flexible business policy control across enterprise and cloud, including web, social and mobile networks. Solving the most sophisticated security challenges requires an advanced approach that is built upon a proxy-based architecture. This approach allows you to leverage best of breed security technologies to provide a safe and confident cloud and network experience. Doing so allows you to address three core shifts occurring in today's evolving IT landscape. Seismic shifts in the enterprise IT environment are driving a requirement rethink security. New connectivity options have emerged, and encrypted traffic is on the rise, creating blind spots for security controls. Wi-Fi and 4G/5G have become the standard connectivity norm even in the office, causing the traditional network perimeter to essentially dissolve, and cloud services like salesforce.com and Office365 foster new work patterns. In this changing environment, the Cloud Generation Gateway delivers absolute security by providing full visibility and control for web and cloud access, regardless of location, from any device, even if the traffic is encrypted. Sanctioned cloud adoption and shadow IT spawned by the easy availability of click-to-compute cloud applications and services like Box or AWS, as well as rapidly shifting regulatory requirements like those emerging in the European Union are also creating concerns around cloud data security, data residency and compliance. The Cloud Generation Gateway allows customers to assess and control the risk of unsanctioned cloud usage, while adding critical security controls to eliminate data leakage, retain data residency through tokenisation, and maintain compliance for sanctioned cloud applications. Endpoints have evolved beyond the traditional computing platforms of servers and desktops, yet the security controls for the next generation endpoint have not evolved with them. Connected computing environments like mobile and Internet of Things introduce new attack surfaces that must be protected, yet unfortunately endpoint security controls are not the answer. Organisations leveraging new devices are simply unable to deploy endpoint security controls because the devices lack the interfaces to do so. The best way to effectively protect these devices is via cloud generation gateways, which can broker the interactions the devices have with the world around them. Doing so allows organisations to perform in-depth inspection and gain complete visibility even when endpoint security cannot be used. Blue Coat brings together the industry's most sophisticated technologies for mitigating risks and creating business advantages. 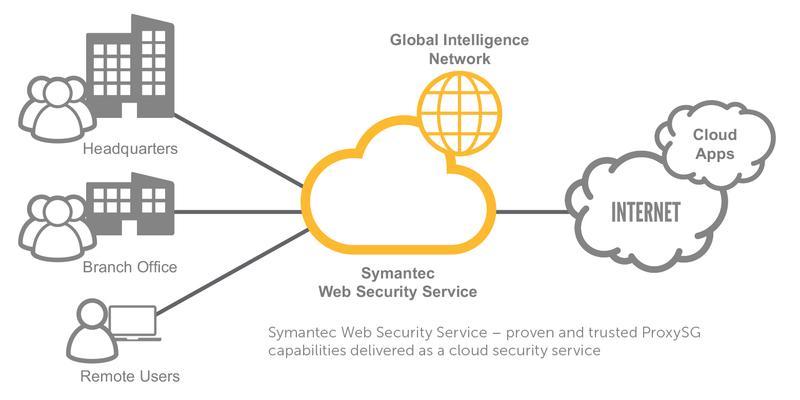 As a core part of the Blue Coat Security Platform, our proxy architecture - on-premise, in the cloud, and hybrid - will protect you against web and network-based threats, enable cloud data protection, and give you flexible business policy control across enterprise and cloud, including web, social and mobile networks. Offers on-demand web security, providing customisable reporting and actionable intelligence that enables you to improve the effectiveness of your web application and operation controls. The Blue Coat Cloud Service identifies and categories new web content in real-time, so you have up-to-date protection against web-based threats.